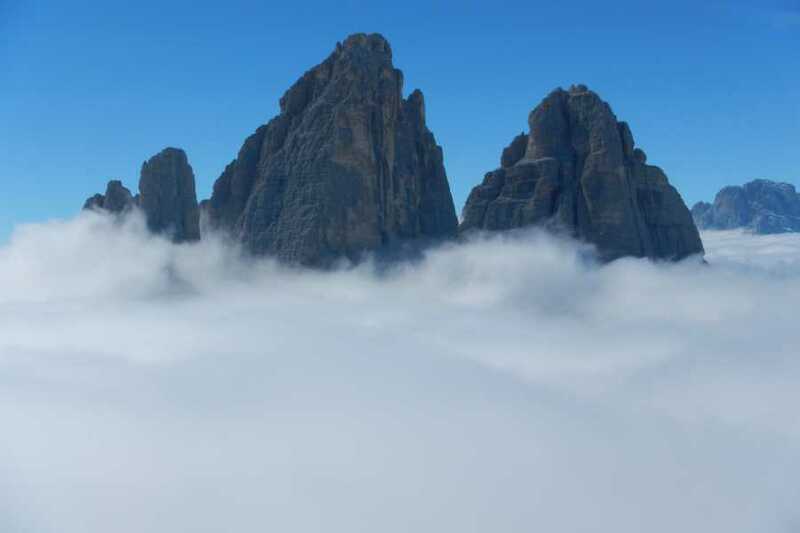 Three Peaks of Lavaredo, in particular, his majesty Cima Grande (Big Peak) are seen as a symbol of Dolomites, and undeniably one of the most coveted ascends in this world of mountain tops. Even though called a normal route, first opened to the public in 1869, by Grohmann, Innerkofler e Salcher, it is not as simple as it may sound. This is a real voyage in the heart of the mountain, in the search of its curves and cracks, allowing you to have the unforgettable climbing day. At least 3 hours are needed to go up, and 3h to get down, mainly climbing, which will make this day quite long and demanding. The maximum difficulty is grade IV, but continuous concentration and familiarity with terrain, make this particular ascent adventurous even after 150 years since it was conquered for the first time. It is reserved for more experienced climbers, who would like to sit on the top of one of the most beautiful rocks in the world. Ascend is rather long and strenuous, recommended only for the most agile and confident climber who are already familiar with the Alpine terrain. Starting point: 07:00am from Chalet Lago d'Antorno - Misurina. Finish: 19pm at Chalet Lago d'Antorno - Misurina. Clothing and equipment: Technical alpine clothing, wind/waterproof jacket, harness, climbing helmet climbing shoes,, energy snacks and drink, Travelsport may provide all required technical equipment. Excluded Services: travelling costs from starting point to Tre Cime di Lavaredo (to be divided equally with other participants. ,Half board at refuges Unless specified otherwise in the Included services above, all other services are duly excluded. Number of participants: Max 2.